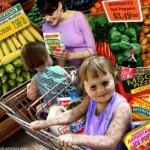 Home→Uncategorized→Are Our Children Being Innocently Poisoned? People are generally so trusting of the food chain that they do not even read the labels of the foods and drinks they consume. Many people are of the opinion that “it wouldn’t be allowed in food if it was bad for you”, but large corrupt corporations, biased research, bought-out organisations that claim to be regulating the products for our good and mass-marketing have enabled this not to be the case. We have often heard that artificial sweetener and certain food additives such as Monosodium Glutomate (MSG) are bad for our health but has much of this information actually made a difference to how we feed our children? I would like to draw your attention in particular to a deadly chemical that is widely available in unlimited amounts in products – including products that are specifically aimed at children, and more importantly are very widely used by playgroups, parents, schools and nurseries under the false belief that it is actually good for children. There is to date NO artificial sweetener that is actually proven to be safe to consume. In fact many have been proven to cause tumours and cancer with prolonged usage. The dangers of small amounts of these additives used in controlled amounts may be considered safe by the FDA, but the fact that sweeteners are now included in the ingredients of so many foods including health foods and drinks means that it will accumulate in our system and build up to levels that are harmful, especially to children, pregnant and nursing Mums and those with compromised immunity. Sucralose has been linked to obesity, aborted pregnancies, anaemia, increased sugar cravings, digestive problems/conditions, migraines and seizures. Acesulfame K has been linked to kidney tumours, although is usually not found on its own but part of a toxic sweetener blend. However the most dangerous sweetener of all and the one I will concentrate on is Aspartame. To first understand why Aspartame is on the market and in our foods, it is necessary to understand who it got there in the first place. It was discovered by accident in 1965 when James Schlatter, a chemist of G.D. Searle Company, was testing an anti-ulcer drug. Aspartame was approved for dry goods in 1981 and for carbonated beverages in 1983. It was originally approved for dry goods on July 26, 1974, but objections filed by neuroscience researcher Dr John W. Olney and Consumer attorney James Turner in August 1974 as well as investigations of G.D. Searle’s research practices caused the U.S. Food and Drug Administration (FDA) to put approval of aspartame on hold (December 5, 1974). On January 21, 1981, the day after Ronald Reagan’s inauguration, Donald Rumsfeld, the CEO of Searle and the main financer to Ronald Reagan’s election campaign, re-applied to the FDA for approval to use aspartame as a food sweetener. Reagan’s new FDA commissioner, Arthur Hayes Hull, Jr., saw that it became approved. In 1985, Monsanto purchased G.D. Searle and made Searle Pharmaceuticals and The NutraSweet Company separate subsidiaries. Aspartame accounts for over 75 percent of the adverse reactions to food additives reported to the FDA. Many of these reactions are very serious including seizures and death and are detailed below. With the backing of such a large and powerful (and corrupt) corporation such as Monsanto, there is very little we can do to take this dangerous substance off the market. However what we can do is spread awareness to people so they can decide whether to keep buying and feeding this to themselves and their families. The more these items are left on the shelf of supermarkets, maybe the message will get through that we do not want to have this poison in our food chain. I feel it is imperative that products containing sweetener and especially aspartame are not given to our children by establishments such as schools, nurseries and playgroups where the parents have no control over what is given to their children during the times when they are there. So if you want to take action, write a letter to your school or education authority. The more people that write in, the more they will listen! Phenylalanine (50% of aspartame) – Phenylalanine is an amino acid normally found in the brain. Persons with the genetic disorder phenylketonuria (PKU) cannot metabolize phenylalanine. This leads to dangerously high levels of phenylalanine in the brain (sometimes lethal). It has been shown that ingesting aspartame, especially along with carbohydrates, can lead to excess levels of phenylalanine in the brain even in persons who do not have PKU. Many people who have eaten large amounts of aspartame over a long period of time and do not have PKU have been shown to have excessive levels of phenylalanine in the blood. Excessive levels of phenylalanine in the brain can cause the levels of seratonin in the brain to decrease, leading to emotional disorders such as depression. It was shown in human testing that phenylalanine levels of the blood were increased significantly in human subjects who chronically used aspartame. Aspartic Acid (40% of Aspartame) – Dr. Russell L. Blaylock, a professor of neurosurgery at the Medical University of Mississippi, recently published a book thoroughly detailing the damage that is caused by the ingestion of excessive aspartic acid from aspartame. Blaylock makes use of almost 500 scientific references to show how excess free excitatory amino acids such as aspartic acid and glutamic acid (about 99 percent of mono-sodium glutamate (MSG) is glutamic acid) in our food supply are causing serious chronic neurological disorders and a myriad of other acute symptoms. Methanol (aka wood alcohol/poison) (10% of aspartame) – Methanol/wood alcohol is a deadly poison. It is the poison that has caused some “skid row” alcoholics to end up blind or dead. Methanol is gradually released in the small intestine when the methyl group of aspartame encounter the enzyme chymotrypsin. The absorption of methanol into the body is sped up considerably when free methanol is ingested. Free methanol is created from aspartame when it is heated to above 86 Fahrenheit (30 Centigrade). This would occur when aspartame-containing product is improperly stored or when it is heated (e.g., as part of a “food” product such as Jelly). Due to the lack of a couple of key enzymes, humans are many times more sensitive to the toxic effects of methanol than animals. Therefore, tests of aspartame or methanol on animals do not accurately reflect the danger for humans. As pointed out by Dr. Woodrow C. Monte, director of the food science and nutrition laboratory at Arizona State University, “There are no human or mammalian studies to evaluate the possible mutagenic, teratogenic or carcinogenic effects of chronic administration of methyl alcohol. Diketopiperazine (DKP) – DKP is a by-product of aspartame metabolism. DKP has been implicated in the occurrence of brain tumours. Olney noticed that DKP, when nitrosated in the gut, produced a compound that was similar to N-nitrosourea, a powerful brain tumour causing chemical. Some authors have said that DKP is produced after aspartame ingestion. I am not sure if that is correct. It is definitely true that DKP is formed in liquid aspartame-containing products during prolonged storage. Aspartame accounts for over 75% of the adverse reactions to food additives reported to the FDA. Many of these reactions are very serious including seizures and death. 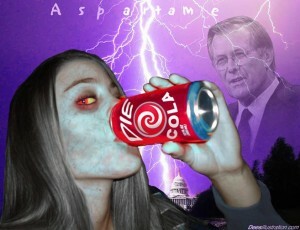 According to researchers and physicians studying the adverse effects of aspartame, the following chronic illnesses can be triggered or worsened by ingesting of aspartame: Brain tumors, multiple sclerosis, epilepsy, chronic fatigue syndrome, parkinson’s disease, alzheimer’s, mental retardation, lymphoma, birth defects, fibromyalgia, and diabetes. Additives by law must be inert or non-reactive. Inert products do not produce a list of 92 documented symptoms from 4 types of seizures to coma and death, nor necessitate a 1038 page medical text. (Aspartame Disease: An Ignored Epidemic, H. J. Roberts, M.D.) Nor would consumers using this product need to be detoxed. “What To Do If You Have Used Aspartame” by neurosurgeon Russell Blaylock, M.D. 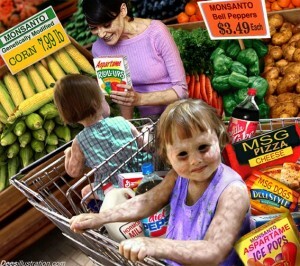 Even if you do not believe this yourself – please don’t feed it to your children. They have no choice in this and they will pay the price.